FeaturesSize: 7.48"(L)*1.97"(W)*3.54"(H)FABRIC:FABRIC: The fancy clutch handbags made of beaded and sequin,very stylish and classyOccasions: Wedding/prom/party/black tie/show/cocktail/night out.Fit enough: Cell phone/small wallet/mirror/lipstick/makeups/cash/credit card/car keys.Package Included:1 x Evening Clutch Bags1 x 47.25" Removable Long Chain.Notes:Due to differences between monitor displays, actual color may vary slightly from image.Please allow the smell in the course of packing and shipping, but it will be disappeared in a few days air out.Please allow 0.3"-0.9" in size error due to manual measurement. And please confirm the size info according to our description instead of the photos.About Chichitop"Let's Make Things Better." We strive to put our hundred percent to resolve your issues and try our best to achieve your satisfaction! 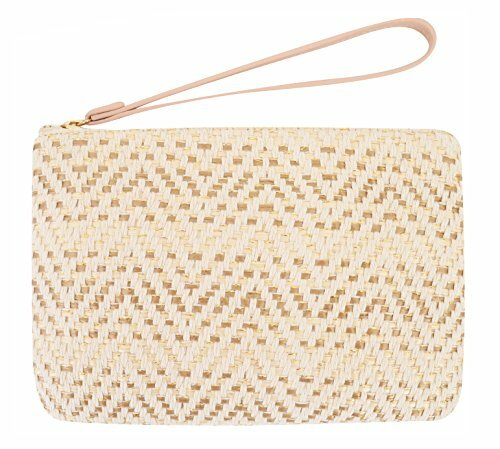 About Agneta: We have been focusing on women's handbag products, each product is only for each beautiful you. I believe you will be amazed at the unique look and quality of our bags. Easy to match and suitable for any occasion. Hope you don't have to worry about choosing which packs to carry out before you go out. Dear Buyer: Thanks for your business! Your positive feedback will be greatly appreciated! If you have any questions, please don't hesitate to contact us via email directly. 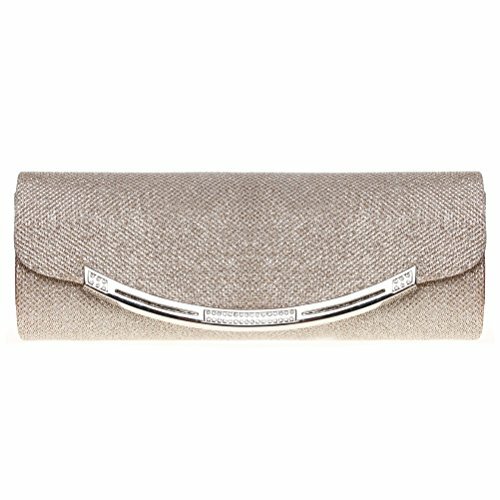 Our Stylish satin evening clutch bag is covered with glitter fabric, will add a subtle glow to your evening formal attire. The open cover is decorative with sparkling rhinestones and shining polyhedron Paillettes.It is enough to fit a cell phone, compact mirror, lip gloss and a pack of gum. A small interlayer to put some thin sheet like cards and notes. The removable shoulder chain inside can provide you a shoulder bag style. It is a 3 styles in 1 bag - clutch, shoulder, crossbody bag. 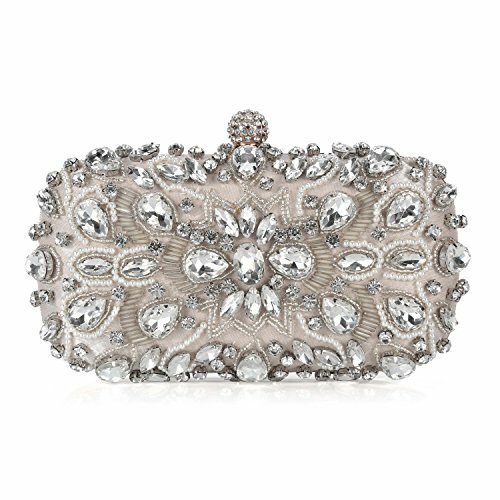 It's so elegant for wedding, party, ball, family reunion, prom, banquet, dinner and other important formal occasions. Features:Size: 24cm x 10.5cm x 4.8cm / 9.45" x 4.13" x 1.89".Size of Chain: 120cm unfolded, about 50cm using length. Note: 1. The Color will be slight different in different lights.2. The Size will be some errors because of manual measurement. 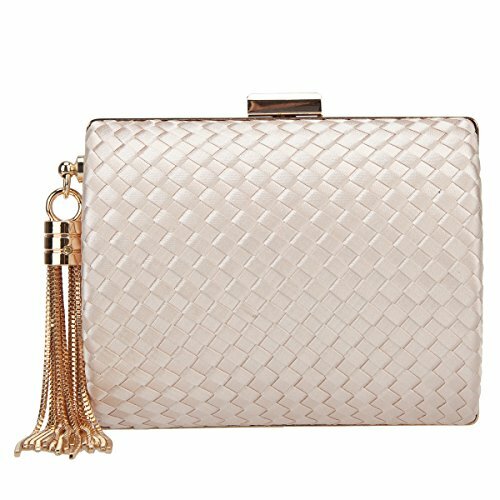 FeaturesSize: 6.69"(L)*2.75"(W)*4.13"(H).Material: The fashion clutch handbags made from silk and satin,noble and elegant.Occasions: Wedding/prom/party/black tie/show/cocktail/night out.Fit enough: Cell phone/small wallet/mirror/lipstick/makeups/cash/credit card/car keys.Package Included:1 x Tassel Evening Clutches Bags1 x 47.24" Long Removable ChainNotes:Due to differences between monitor displays, actual color may vary slightly from image.Please allow the smell in the course of packing and shipping, but it will be disappeared in a few days air out.Please allow 0.3"-0.9" in size error due to manual measurement. And please confirm the size info according to our description instead of the photos.About Chichitop"Let's Make Things Better." We strive to put our hundred percent to resolve your issues and try our best to achieve your satisfaction! 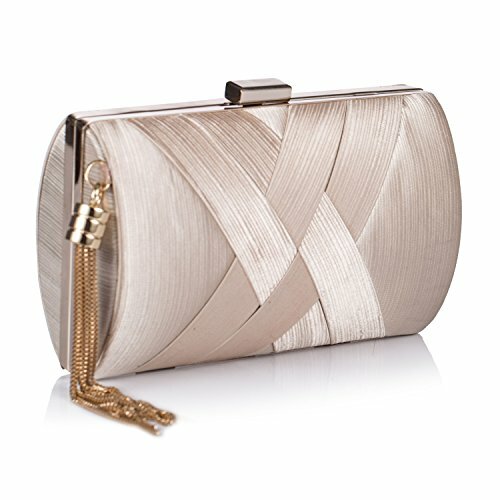 Elegant pleated satin evening handbag, good choice for party, wedding and other special occasions. 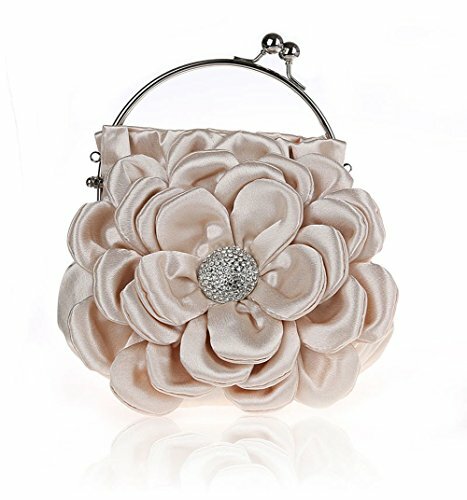 Perfectly pleated satin fabric gives this chic large clutch the look of a beautiful flower front detail. 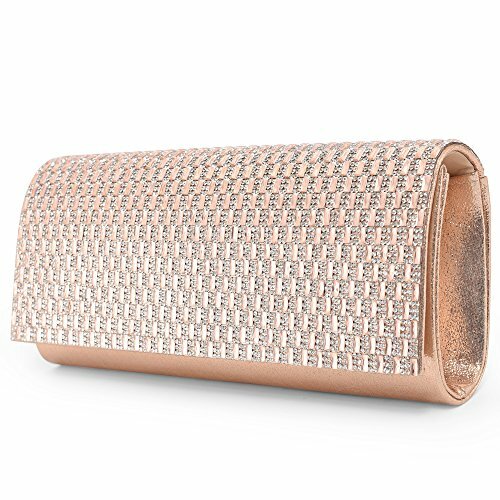 The fashion clutch with pleated design and features a smooth satin back panel add a soft touch to the overall look. The interior offers just enough room for your most important items and includes a small slide pocket for valuables while a long chain offer versatile carrying options as a hand held clutch, short shoulder bag,tote bag or crossbody bag. NOTE: Due to differences between monitor displays, actual color may vary slightly from image. 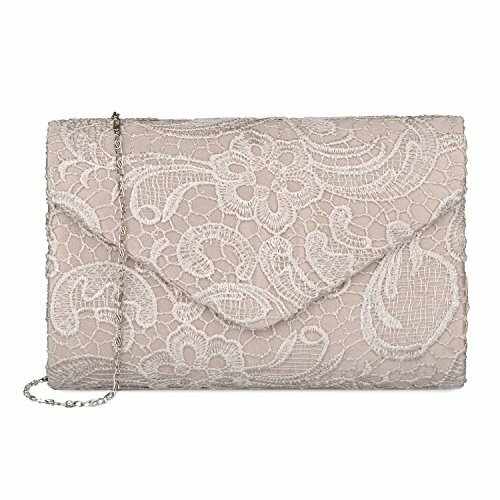 Features: Size: 8.6"(L) *1.58"(W) * 5.51"(H) Material: soft satin lace Compartment: one main compartment + one small pocket Closure type: magnetic closure Occasions: wedding/prom/party/black tie/show/cocktail/night out Fit enough: cell phone/small wallet/mirror/lipstick/makeups/cash/credit card/car keys Package Included: 1 x Evening Clutches Bags 1 x 46.49" Chain Stylish minimalist style, timeless classic. Ultra-elegant design, chic style for ladies, a variety of colors for you to choose. Perfect match with your dress , hat and high-heeled shoes. Enjoy the envious sights of others! 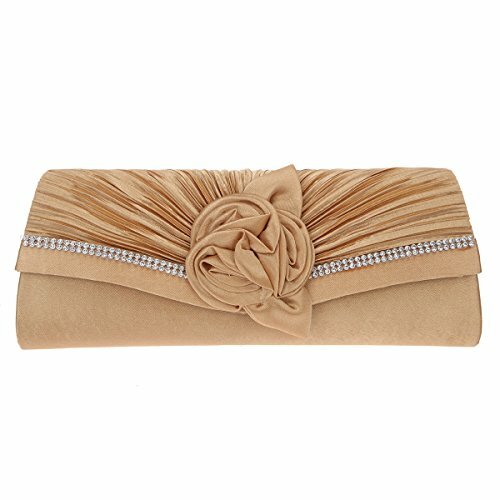 Looking for more Clutch Bag Apricot similar ideas? Try to explore these searches: Moisture Maximizer, Venture Jacket, and Gray Baseball Pants.